The Gilera company was founded in 1909 by Giuseppe Gilera in Milan. His first machine was a 317cc overhead-valve engine which had a belt drive. Subsequent engines were side valve until 1926. They then went back to over-head valves. In 1935 Gilera acquired rights to the Rondine four cylinder engine. This formed the basis for Gileras racing machines nearly forty years. From the mid thirties Gilera developed a range of four-stroke engine machines. The engines ranged from 100-500cc. The most famous of which was the 1939 Saturno. Post war machines were based on four-stroke singles and parallel twins. From this came the famous World Championship winning San Remo. It takes it's name from it's victorious debut at the 1947 Ospedaletti Grand Prix near San Remo.Gilera rode these fast machines himself and broke many records with them. Go for it my son!! In 1969 the company was bought out by the Piaggio Group, constructors of the Vespa scooter. 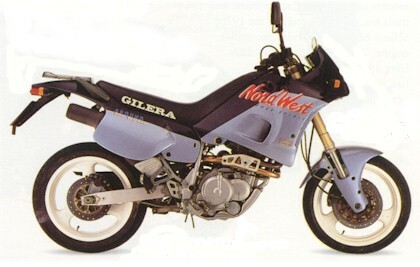 It developed new 49cc-125cc two-stroke bikes as well as continuing to develop the original Gilera four-stoke range. 1985 Brought a new 350cc four-stroke single engine. Later this was enlarged to 558cc and was used in the trail bikes and the cafe racer style Nuovo Saturno. There was also a return to Grand Prix racing in the 250cc class. In 1993 Piaggio unexpectedly closed the Gilera factory at Arcore bringing to an end over 84 years of motorcycle manufacturing. New Gilera models were released by Piaggio in 1987 and traded on its association with Gilera's sporting reputation. In 1992, Gilera made a return to the Grand Prix arena and Piaggio continues to produce small-displacement motorcycles with the Gilera name. Please note we will continue to add more information to these pages in time. If you wish to add content to these pages that you feel is interesting, important or write about your machine, e-mail it or bung it on a fax to us.